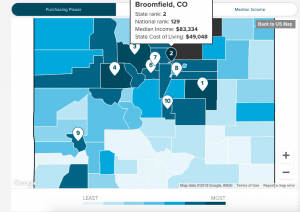 BROOMFIELD and WELD COUNTIES — A new study from SmartAsset, a financial technology firm, found that Broomfield has the second-best purchasing power ability in Colorado. The study compared cost of living as a percentage of median income to determine the purchasing power for different Colorado counties. Broomfield ranks No. 2 with an index score of 80.13. Its cost of living was $49,048 and its median income was $83,334. Elbert County ranked No. 1 with an index score of 83.38. Weld County ranked No. 5 with a score of 76.05. Its cost of living was $38,995 and its median income was $62,820. The full top 10 were: Elbert, Broomfield, Grand, Eagle, Weld, Clear Creek, Gilpin, Arapahoe, Ouray and Teller. The full methodology compared two different cost of living numbers for one adult person: the first is the baseline cost of living in an area and the second is based on expenditures typical of someone making a county’s median income. Those two cost of living numbers were combined using a weighted average based on how close each county’s median income was to the minimal livable income in that area. Income taxes were subtracted. Finally, the purchasing power was calculated by determining the weighted cost of living as a percentage of median income.